Three Pillars of the Aurelia, from the left: Ing. De Virgilio, Gianni Lancia, and Comm. Vittorio Jano. From their beginnings in 1906, Lancia was known as a maker of advanced cars throughout the 20th century. Their cars crossed conventional understandings, with combinations of characteristics not typically found in other cars. Lancias were sporting and comfortable, durable and lightweight, quick and relaxing to drive. With advanced chassis, independent suspensions, and unique compact motors, their cars always stood outside the norm. This was part of the Lancia tradition, one which included continual in-depth technical innovation. Their Lambda of 1922 was the first evidence of this, featuring unit body chassis, independent front suspension and a narrow V4 engine, all first for production automobiles. 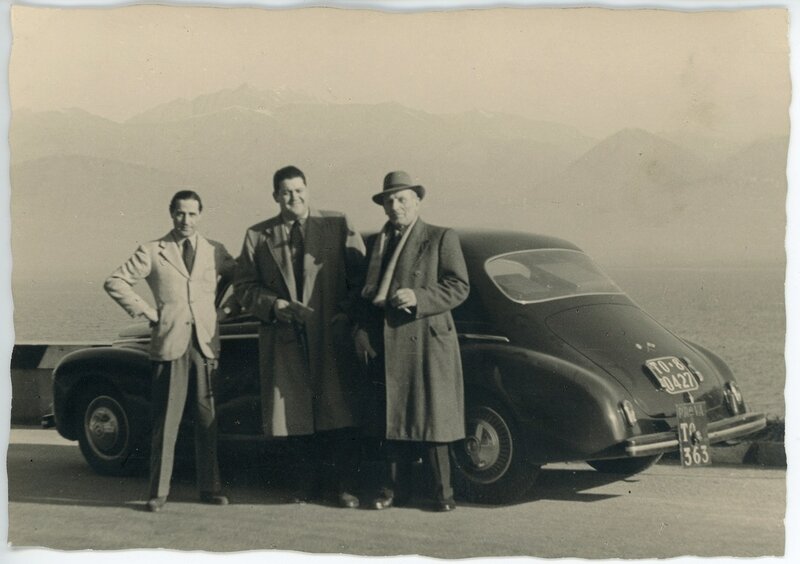 This car was followed up by a number of equally important models, especially the grand Astura V8, and the aerodynamically designed 1937 Aprilia which featured independent rear suspension. They achieved this meticulous technical development with an unusual combination of craftsmanship and industrial production. With fanatical commitment to design and attention to detail, most all made in house, and designed by them. This moderately-sized company had their own foundry, made their own parts, and developed many of their own manufacturing processes. By the 1950s Lancia had 8,000 employees making 10,000 cars and 2,000 heavy trucks yearly. Francesco De Virgilio, a young engineer who had joined Lancia out of school in 1939, responsible for the V6 engine design. These three can be considered as a special combination, which one might think of as a spark plug, wisdom, and young legs, worked together to push themselves and the company to make this new and special car.